Flow cytometric analysis of live mouse splenocytes using CD62L/L-Selectin (MEL-14) Rat mAb (PerCP-Cy5.5® Conjugate) and co-stained with CD44 (IM7) Rat mAb (violetFluor™ 450 Conjugate) #53289 (right), compared to concentration-matched Rat Isotype Control (PerCP-Cy5.5® Conjugate) (left). For optimal flow cytometry results, we recommend 0.25μg of antibody per test. CD62L/L-Selectin (MEL-14) Rat mAb (PerCP-Cy5.5® Conjugate) recognizes endogenous levels of total mouse CD62L protein. 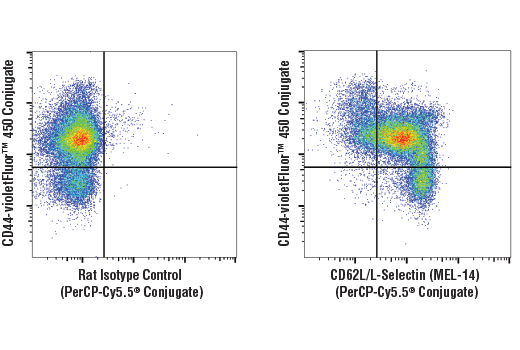 This Cell Signaling Technology antibody is conjugated to PerCP-Cy5.5® and tested in-house for direct flow cytometric analysis in mouse cells. L-selectin (CD62L, MEL-14, LAM1, SELL) is a cell adhesion molecule, responsible for homing and mediating the binding of lymphocytes to high endothelial venules (HEV) in secondary lymphoid tissues (1-5). It is a commonly used marker for distinguishing naive and memory T cells from effector T cells (6). Gallatin, W.M. et al. Nature 304, 30-4. Tedder, T.F. et al. (1989) J Exp Med 170, 123-33. Tedder, T.F. et al. (1990) J Immunol 144, 532-40. Berg, E.L. et al. (1991) J Cell Biol 114, 343-9. Finger, E.B. et al. (1996) Nature 379, 266-9. Sallusto, F. et al. (1999) Nature 401, 708-12.
violetFluor is a registered trademark of Tonbo Biosciences.